"Is the bipolar asparagus served hot or cold?" Served with a rather presumptuous wine the chief refers to as 'the rascal of the vineyard'. 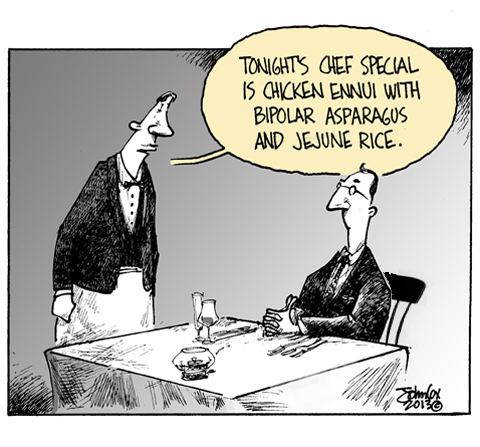 I believe the bipolar asparagus would be alternately hot AND cold, providing an interesting counterpoint to otherwise somewhat boring chicken and rice. That's worthy of the New Yorker. Or, rather, the New Yorker is worthy of it! Why thank you for the nice word. Sure would like a swing at it. What's for dessert? Vanilla fugue? Maybe an inside-out lava cake? Would you like some hubris on your arugula? This page contains a single entry from the blog posted on August 27, 2013 12:10 AM. The next post in this blog is Theater Production Poster Illustration Idea.